Perhaps you have traveled specifically for weather – sunshine on the warm sand or a cool breeze over rolling green hills. Travel for rain, though? Or even a monsoon? 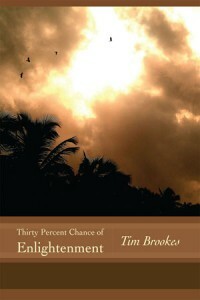 Sounds unappealing, but Thirty Percent Chance of Enlightenment will change your perception of ideal travel weather. In fact, you may find yourself hoping for a little rain. In this adventure, hard science turns to self discovery as Brookes tackles obstacle after obstacle on his trip to India in search of the monsoon. With the goal to learn and write about monsoon forecasting, plans change when he is banned from each India Meteorological Department he visits. He soon learns his trip has a different purpose. With an attitude nothing short of kicking and screaming he finds himself forced to fill his time as a tourist. With the influences of the monsoon never far from his mind, he asks every person he encounters about this phenomenon only to find as many different answers as questions asked. Before the reader’s eyes, slowly his frustrations become revelations. Brookes reminisces about his childhood and reflects on the Indian culture before him. He comes to realize the importance of the monsoon, of rain and of the weather from a spiritual perspective instead of that from the science of weather forecasting. If you know little about weather, you may find the first chapter or two dry, perhaps a bit boring, but hang in there. As Brookes’ trip begins you will find it harder and harder to put the book down. I found myself plowing through the last half of the book just to learn of the next meaningful encounter to come. At times tangents are presented that appear to go completely off topic, but in the end you find yourself learning a bit about history and realizing that it all ties together. For anyone who has ever been amazed at how a family of five can travel on a moped or humbled by the generosity of another culture, this book is for you. You will find stories to relate to, new ideas to embrace and greater reason to continue exploring the world. Check out the book’s site and then purchase your very own on Amazon!